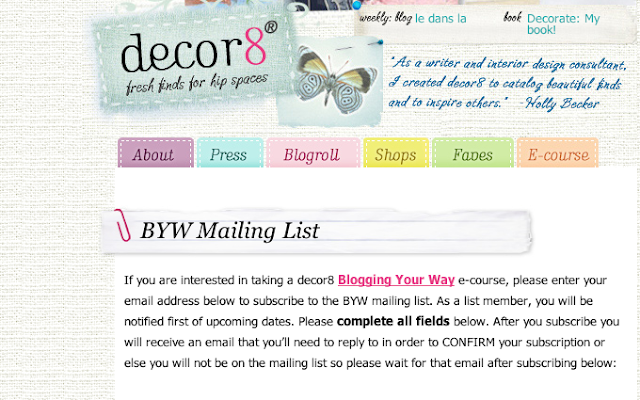 A few months back I took a blogging class called Blogging Your Way with Holly Becker of Decor8 and Leslie Shewring of A Creative Mint. The class was fantastic! It was an online class so I never actually met the teachers. Lucky me because Holly Becker just wrote a new awesome book called Decorate and she is doing a book tour! I just started reading this book and it has already inspired me to start sprucing up the rooms in my home. 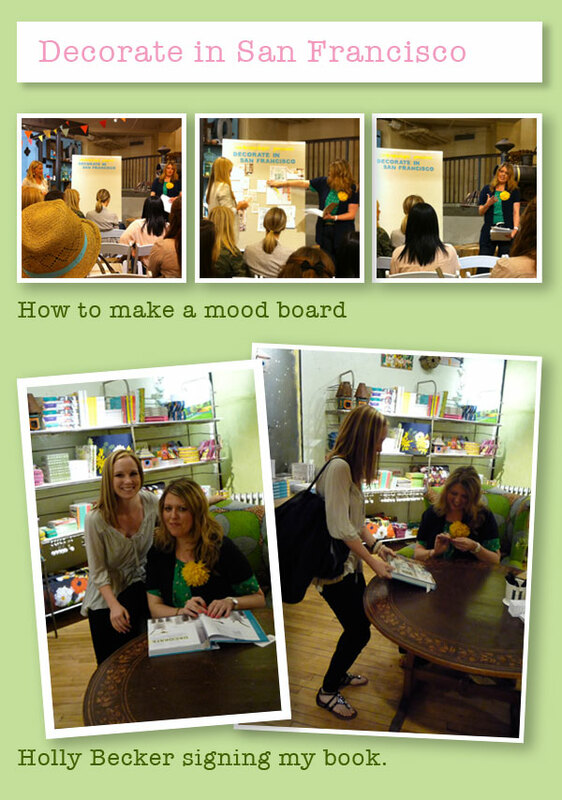 Last Thursday Holly was in San Francisco at Anthropology giving a mood board demo with Leslie and signing copies of her new book. It was really amazing to meet both of the teachers of this online class. Holly lives in Germany so I never in a million years thought I would actually get to meet her. She was so personable and friendly. What a true inspiration. A few other really exciting things have been happening in my life. My college roommate is getting married this coming Sunday in New Hampshire! I was worried to buy tickets for this even because I have been in-between jobs, but one day I just decided to go for it and make plans to attend. It's hard to be on the left cost, when a lot of your friends and family are on the right cost. I have missed a few of my friends weddings due to cost and limited vacation time, and I decided that I didn't also want to regret missing this one. Aimee (the bride) was my college roommate for three years and brought a lot of fun and excitement into my workaholic life. I leave tomorrow for an entire week back east which will include a stop in Vermont to see my parents, a stop in Boston to visit friends that I miss so much, and then off the the wedding in New Hampshire. Also, I landed a very exciting new job as an Art Director with a startup company in San Francisco. I can't talk about the details yet, but stay posted for more info. I'm bursting with excitement! I really love when I take a leap of faith and everything just falls into place and works out. I'm going to try to take a million pictures of my trip and post them so you can all see New England. I was recently inspired to make Peach Cobbler (gluten free of course) for the second time. My first try was okay but was more like a crisp rather then a cobbler, you can see that recipe here. A guy I was dating told me that it was his favorite dessert so I looked up a recipe, went to the store and got the many types of flower required to make this yummy dish. Then, he dumped me over text message. Yeah, burn. So anyway, I'm stuck with all of this stuff to make Peach Cobbler and I have a dinner party to go to tomorrow so problem solved. This Cobbler smells amazing when you cook it and tastes even better. I'm serving mine with Vanilla Ice Cream. Can't wait for the dinner party! Preheat the oven to 350 degrees. Mix all the dry ingredients together in a medium bowl. In a separate bowl, mix together the liquid ingredients except for the milk. Add the liquid ingredients to the dry ingredients. Slowly stir in the milk until the batter reaches the right consistency- about 1 1/2 cups. In another small bowl, mix together the agave syrup, orange juice, and sweet rice flour. Combine this mixture with the peaches in a 9 x 13 baking pan. 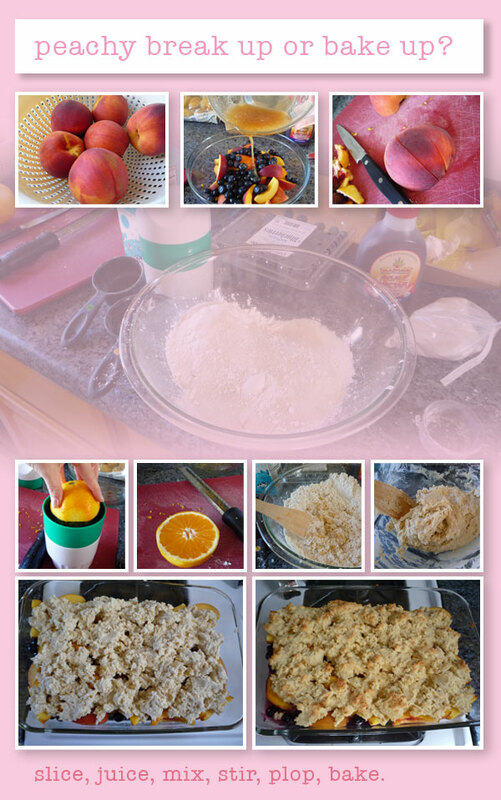 Spoon the batter over the peach mixture. You may have extra batter. Bake for about 45 minutes on 350 degrees. One of my good friends got engaged at the start of the year and she asked me to design her wedding invitations. I'm pretty excited about this project because I love designing invitations and the color pink. These ones so far in my mind are going to be antique rose, charcoal grey and cream. 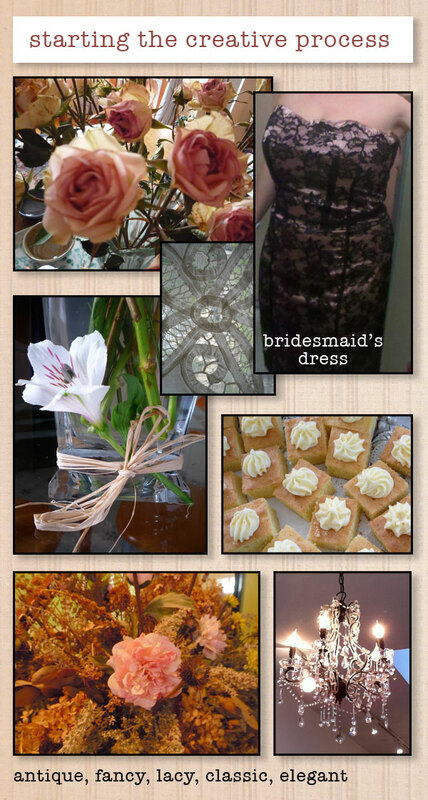 I put together this collection of pictures as an inspiration to my creative process. I was checking my blog stats today, something that I do about once a month. I was pretty happy with the numbers. My unique monthly page hits have doubled since I took the "Blogging Your Way" class about 4 months ago. I learned so many tips and tricks to making a good blog. I feel as though I've implemented about 1/4 of what I learned in that class. Whenever I have a little down time I try to implement a little more of what I learned. This class lets you download the lessons as pdf so that makes it easy to go back and refresh what you learned. If you are interested in taking this class, visit the website, and sign up for the mailing list. It's well worth the price. Blogging Your Way is a self-paced e-course so you can participate whenever you have time each week. Please login at least once weekly to read the topics posted and to complete your homework assignment. Expect to set aside a minimum of 2-3 hours weekly for this four week course. You can absorb everything at your own pace because you will have unlimited access to the site 24 hours a day, 7 days a week. I've been busy this week. I am trying to get a new collection put together called "Zombies are Sweet." I've been taking snapshots of my progress to share with you. 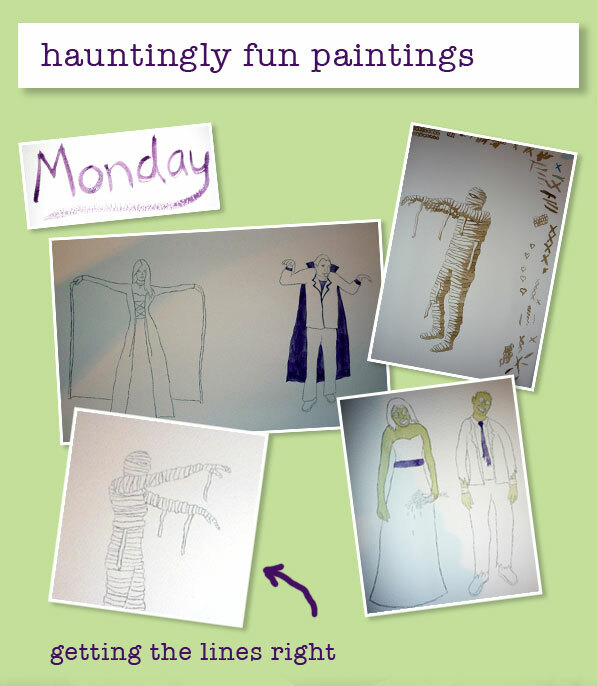 While painting this collection I have been thinking of coordinating patterns to go along along with my ghouls. You can see little sketches of those in the margins. I've been wanting to make a paisley pattern for a long time so I took a stab (no pun intended ha) at it with some ghost inspired paisleys. There are ten different ghouls in this collection and I have some trick or treating goodie bag ideas. I also want to make these into a paper tableware and greeting card collections. I am now working on isolating all of these images and creating surface patterns out of them. The more images I create for licensing collections the more I learn about what to include. This time around I added some key phrases along with some simple patterns I can use as accents or in the backgrounds of images. Life is hectic as always. It's summer time, and for me that means it's all of my nieces and nephews birthdays. 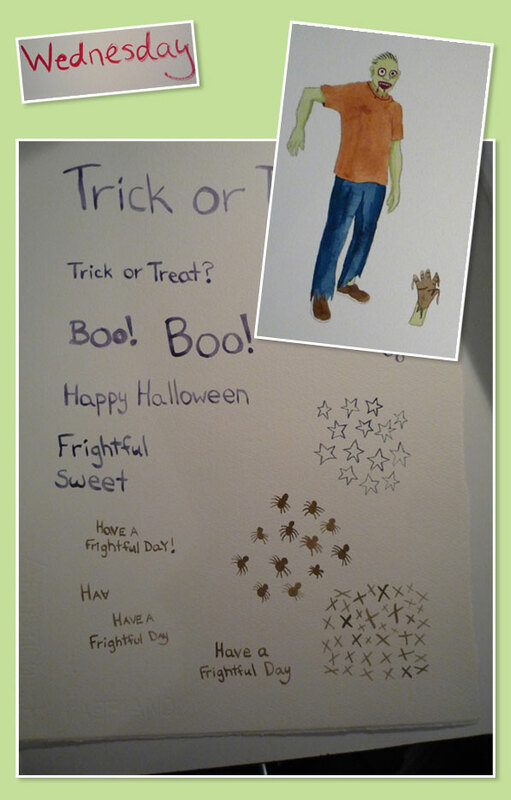 I always send them cards, and I always think I should hand paint or design these cards myself instead of buying them. This year I broke out my paints and my blank watercolor cards and started painting. 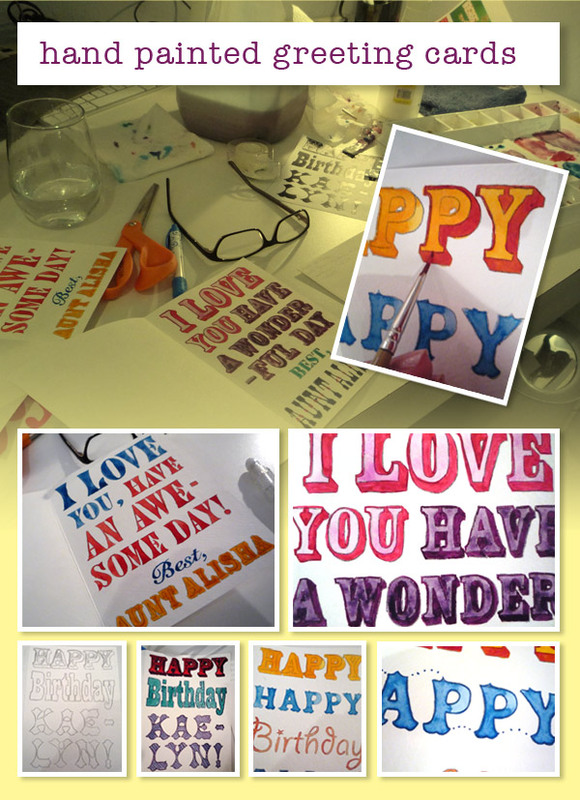 I've been wanting to experiment with painting type for some time so I combined the greeting cards and type. I painted these cards for what seems like forever and I'm still not completely finished yet. I learned a lot about painting type and I still want to experiment with it some more. I have been doing a lot of painting lately and I will post more on that this week. I'm alway thinking I want to do more and get more done. When I actually sit down and paint I realize how long it takes to complete a licensing collection. It feels great to make progress. I am currently painting a Halloween collection. The next two collections I want to paint are flowers and fancy drinks.